Despite the vigorous efforts of “ex-gay” activist Greg Quinlan, legislation to toughen the state’s hate crime and bullying laws advanced Thursday in the New Jersey State Assembly. The proposed legislation also targets bullying in schools. 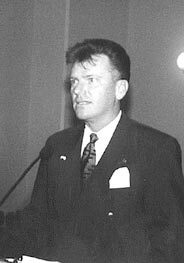 Quinlan recently moved to New Jersey from Ohio, where he lobbied extensively against equality. He is well known as an individual who exaggerates the alleged plight of ex-gays, going as far as claiming harassment, when none has occurred. For nearly an hour, Quinlan led the fundamentalists in a failed attempt to have the Assembly amend the bill to include people who identify themselves as “ex-gay.” According to the Associated Press, Assemblyman Reed Gusciora, D-Mercer, at one point lost patience with the persistent conservatives and a brief shouting match ensued. This is the latest example where “ex-gays” are using the political process to deny healthy and well-adjusted GLBT people equal rights.